Sixty percent of Russians have incompatible images of Stalin in their heads: the cruel tyrant and the victor over fascism. Moscow history teacher Stephan Bochkarev often recalls a lesson he taught his students several years ago. It was a lesson about Joseph Stalin that he happened to be teaching on the day the director of his school decided to observe his class. “I went strictly by the book, talking about the repression, when the director interrupted me and stopped the lesson,” he recalled. “She really did not like the fact that Stalin was presented in a negative light.” Bochkarev, who now works for a private school in Moscow, said his lesson caused a scandal at the school and he subsequently resigned. 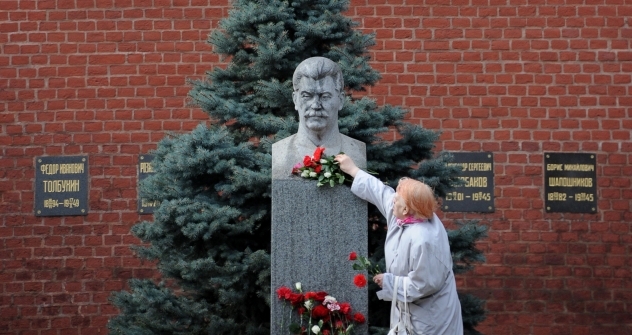 Sixty years after Stalin’s death, he is still cursed, worshipped, and monetized in Russia. Communist Party members march under his image and tourists get their photos taken with Stalin look-alikes on the pedestrian streets. Yet what happened to Bochkarev is becoming less common—and less acceptable. The percentage of Russians with a positive attitude toward the Soviet leader is 30 percent today, according to a Levada Center study. Asked whether they would like to live under Stalin now, only 3 percent said yes. The perception outside Russia is that society is split into Stalinists and anti-Stalinists. But this is outdated, according to sociologists. A majority of Russians, 60 percent in fact, have two seemingly incompatible images of Stalin in their minds: the cruel tyrant who murdered millions of people and the wise statesman who led the Soviet Union to prosperity. In the West, Stalin is best remembered for his forced collectivization of farming, which led to famine and millions of deaths, and the Great Terror, during which thousands were executed and millions more sent to the Gulag for long terms of slave labor. In Russia, his memory is more complex. For some, he is inextricable from the victory over fascism. In Russian society, there is no rational understanding of Stalin’s role, said Boris Dubin, head of sociopolitical research at Moscow’s Levada Center. Any focus on the achievements of the U.S.S.R. under Stalin is interpreted as an attempt to justify his crimes, while putting the emphasis on the terror of his crimes upsets Russians who want to be proud of their past. This duality can be seen in today’s classrooms, where opinions are changing slowly, even if history textbooks published in the last few years tend to ignore Stalin’s crimes. At the request of RBTH, Bochkarev asked his students to write essays about Stalin to express their thoughts. He requested that RBTH use first names only. When discussing Stalin’s popularity, sociologists refer to the “Stalin myth,” which reflects more of a generic heroic symbol of the Soviet people rather than a specific historical figure, Dubin said. Related: Boris Drozdov: "There is no one to tell the young generation"
The pain of memory was so intense that amnesia has been a favorite response, according to sociologists. “This happened by way of erasing the memory of the repressive nature of the totalitarian regime, mass murder, gulags, deportation of entire nationalities,” said Dubin. “In Russia, the memory of the terror has been driven to a far corner, not least because there are no monuments, no memorial plaques, no museums – there is nothing,” added Arseny Roginsky, who heads the Memorial Historical Society, which aims at rehabilitating the victims of political terror. Memorial notes that people are much more interested in their relatives, who died as victims of political repression, than they were in the 1990s. In recent years, the number of people visiting Memorial in search of relatives who disappeared during Stalin’s purges has been growing. About 1,000 people come to Memorial each year, he said, a dramatic increase from the 1990s. The most recent official effort to deal with the issue of Stalin’s crimes took place in 2011 under President Dmitry Medvedev. “This is essentially an attempt to perpetuate the memory of the victims of political repression rather than a de-Stalinization crusade,” said Mikhail Fedotov, head of the Presidential Human Rights Council, which initiated the campaign. The Human Rights Council supports the establishment of memorials to the victims of repression in Moscow and St. Petersburg. The council also proposed creating a National Institute of Memory. Fedotov noted that if Medvedev is appointed prime minister to Putin’s president, the program will continue, though now government officials have slowed the process until the new presidential administration is in place. Roginsky said he was skeptical about the program, since many archives are still kept secret and not open to the public.